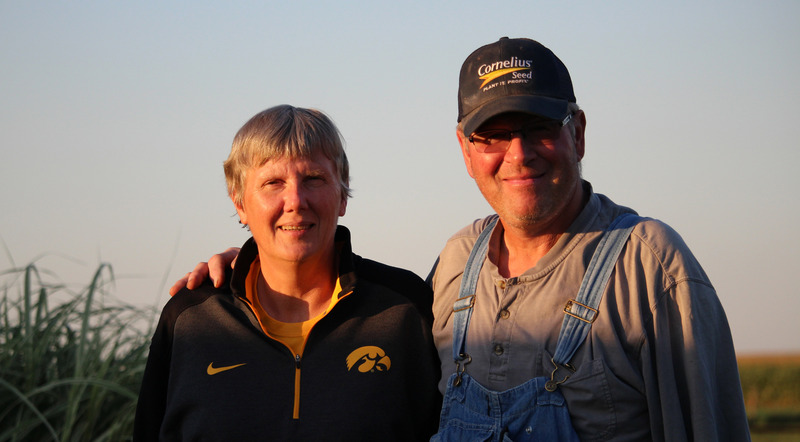 Brian Egel and his wife Pam Finke run a diverse farm operation in Muscatine County, Iowa. Diverse meaning corn, soybeans, oats, and alfalfa, and livestock production including 40 ewes and 50 beef cows. Egel also does custom baling in the summer and fall and sells corn, bean, small grains, and cover crop seed for several companies. Pam works both at the farm and as director of ticket operations for the University of Iowa Athletic Department. “I think about safety in my ‘old age’,” he laughed, as he pointed out some of the most recent upgrades he’s made at his farm. Recently, he had a new stairway system installed on his grain bin that follows the contour of the bin. It has wide non-skid steps and a railing to reduce the risk of falls. Egel knows all too well about falls and farm injuries. At age 8, his left arm was entangled in the auger of a grinder-mixer, resulting in amputation below the shoulder. It happened when he scooped a handful of grain and tossed it into the running auger; he was imitating something he had often observed his dad doing. A few months after the amputation, he was fitted with a prosthetic arm and hook at the University of Iowa Children’s Hospital. Farming with one arm – or an arm and a prosthesis – increases the risk for falls and other farm injuries. Safely mounting or dismounting equipment, climbing, and using ladders require “three points of contact” on the equipment. Try doing that with one arm. In 2005, Egel broke his tibia in a fall while dismounting his tractor. It was the second time he had broken that leg. Whenever he gets on or off a tractor now, he’s facing it. That injury required surgery and titanium hardware to repair the bone breaks, and it put him out of commission for over six weeks. Friends and neighbors stepped in to help Pam with their chores while he was laid up. Since his fall, he’s replaced the narrow steps on three of his five tractors with safety steps and grab rails that he ordered from K&M Manufacturing (Renville, MN) and Unique Design Workshop (DeGraff, OH). The steps he prefers for his older tractor are one-piece closed steps, which he finds to be safest. 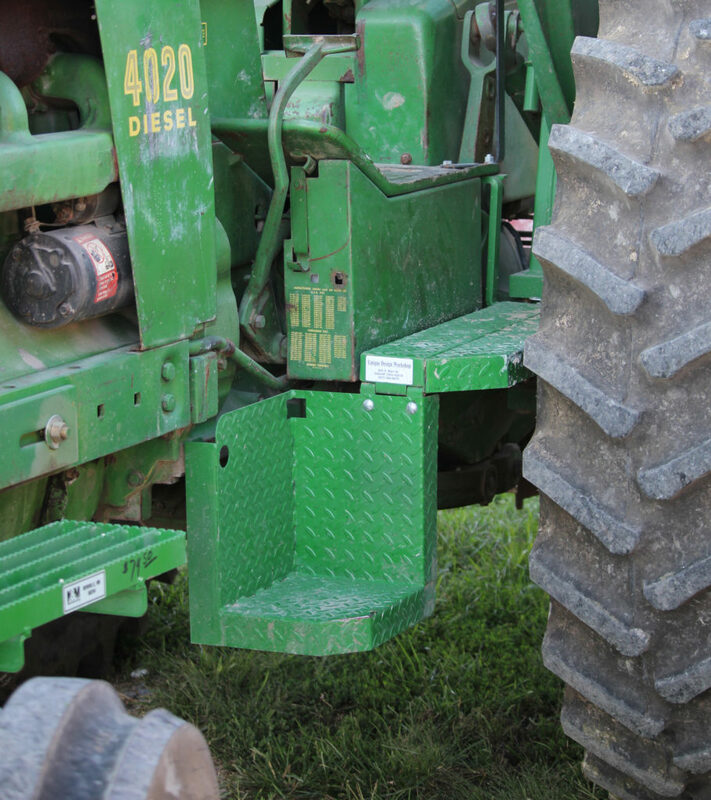 An after-market “service step” mounted on his 4020 now gives him better access to the fuel tank and radiator. He’s also made equipment and safety lighting upgrades as a result of roadway incidents when motorists struck his equipment in rear-end collisions or attempts to pass while he was making a left turn. 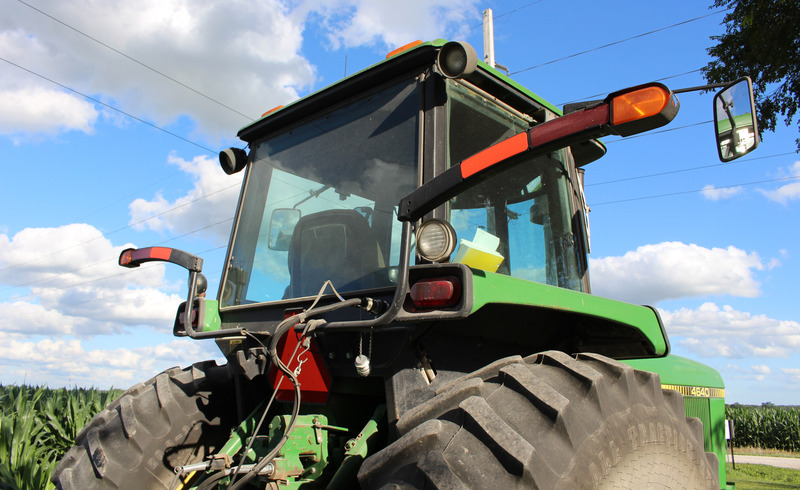 He installed a wide auxiliary light bar to the back of his cab that extends beyond the sides of the baler to improve visibility of the tractor when he’s pulling implements. With the addition of these swing-out lights, drivers on the road see two sets of flashers. His baler has lights and turn signals that coordinate with the tractor's. Avoiding injury in his livestock operation is important too. Like most farmers, he’s had a few run-ins and close calls. In 1994, a boar swung its head into his leg, breaking the fibula. On another occasion, a cow swung a gate around that hit him in the legs and threw him to the ground; he ended up with a bruised bone. Farm work puts a lot of wear and tear on the body. 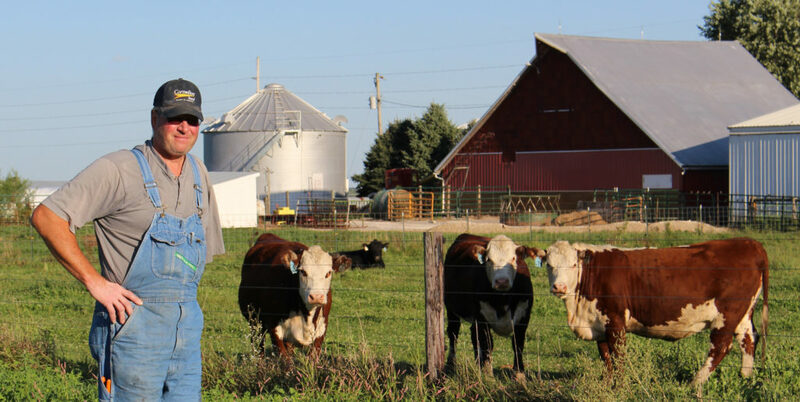 Physical work and stress to the musculoskeletal system for most farmers is distributed between both sides of the body, but the same amount of work, wear, and tear for Egel is all borne on his right side. “I use my mechanical arm and hook in the fall and winter when it’s cooler. In the summer, it’s too hot and uncomfortable and irritates my right arm.” His prosthetic arm attaches with straps that go behind his left shoulder and neck and loop under his right arm ‘like a bra strap.’ His hook allows him to grab objects, carry 5-gallon buckets, stabilize shovels, or start a nail. “One thing about it, I don’t say ‘ouch’ when I hit my hook with the hammer,” he laughed. Every year or so, he takes his “arm” to Davenport for a tune up to adjust the cables and tension of the hook. As his body changes with age, the prosthesis needs to be adjusted as well. He replaces it when it’s “time for a new model” or when the cables wear out. It’s not apparent to most of us that tasks easily done with two arms or hands take so much longer – and a lot more imagination – to complete with only one. He manages a way to attach and detach a PTO shaft with one hand, by bending over and steadying it between his knees. To save wear on his arm and shoulder, he now uses a skid loader instead of manually lifting rolls of bale wrap. He recently bought a seed tender for his planter instead of lifting bags. Simple changes like these save the stress on his right side, but they also make a lot of sense for any farmers in avoiding injury. 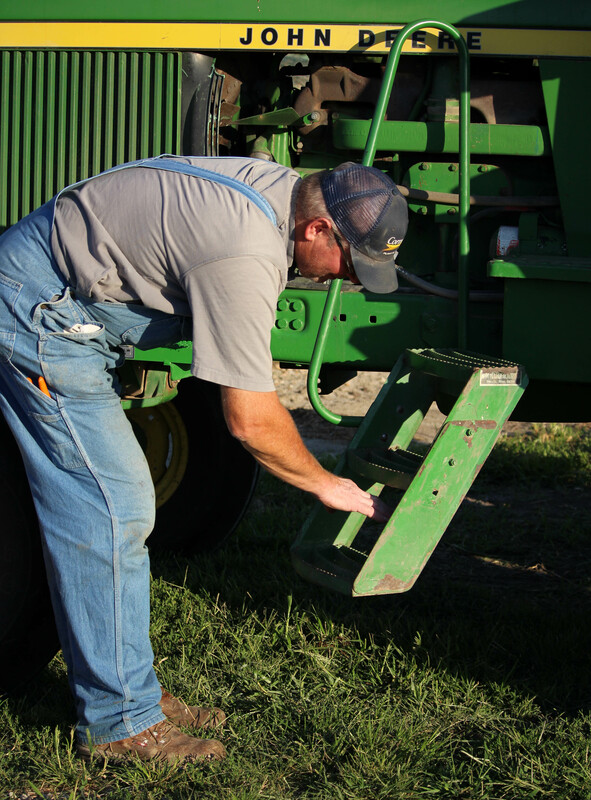 Knowing personally the impact of farm injuries has made him a believer in every day safety and protecting his health. During a short ride in his truck, and he pointed out the wide brim hat he wears when he’s out in the sun. He keeps sets of ear plugs in his trucks and uses them whenever he’s running farm machinery. His older open tractors have ROPS and sun canopies. Most people think of the cost of injury as hospital and medical bills and lost work time. 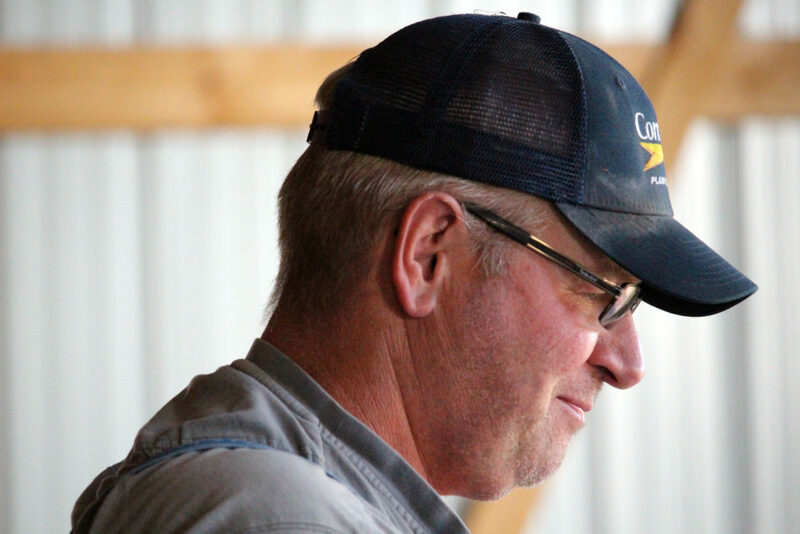 “People don’t realize that farming after injury is expensive. I don’t get things done as fast because everything takes me longer to do,” he explained. Adding or maintaining safety features on equipment costs money. Some work, like welding, has to be hired out or done by friends since he can’t do it himself. 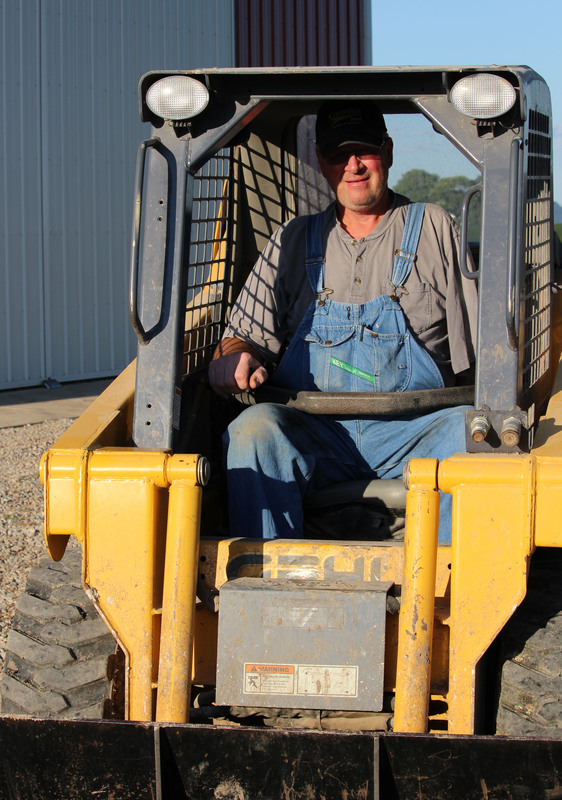 Egel hasn’t needed to adapt controls on his tractors or vehicles, but he did have his skid loader “replumbed” so all hand control functions could be done from the right side. He just replaced a PTO shield on a manure spreader, which cost $100. “I don’t like spending money but it’s something you gotta do.” He doesn’t regret spending money on safety features, though, because he wants to be able to keep doing what he enjoys, injury free. “Some people have told me to go on disability, but I wouldn’t want any other job. I like being my own boss. What advice do they share? 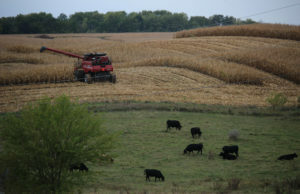 An edited version of this story was originally published in Iowa Farmer Today.